I saw your website yesterday and thought you might like to see the attached image. It is a photo of my broken and much loved Pedalforce RS2 whcih is sadly hanging in the garage awaiting its end. I was in a road race in England when a rider in front of me touched wheels with someone else and fell onto my front wheel; I went down hard breaking a collarbone. The bike as relatively undamaged the only broken parts where the top tube, the saddle and the forks. The forks did not break but the bond between the steerer and the crown broke. 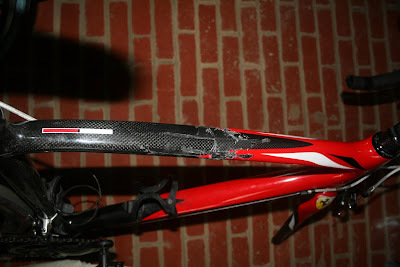 The bike went upside down on impact , when the saddle hit the road the force stretching the tube resulted in it almost breaking, there are a few strands holding it together, though the frame still feels very stiff. Ouch. It was a beautiful bike, but I'm glad he's ok.